On Sunday, snow blew sideways across the garden. Wind raced in from the north, then from the east. Overnight, a thick layer of ice covered the ground, so by mid-day, when the blizzard hit, heavy patches of white quickly piled high. From our kitchen window, I watched the storm howl and decided to seize the opportunity: it was the perfect time to go for a swim. Mr. Green said he’d entertain the two little ones, so I grabbed my suit and goggles, quickly pulled together my swim bag, and raced for the car. Once on the road, I felt the wind tug at the car, the wheels slip over the ice. It’s only a short distance to the pool but I drove at the speed of a tortoise, crawling onto the main highway then easing off. Well before I reached the intersection, I braked. But the car refused to stop, sliding ahead while I pumped furiously on the pedal until eventually the vehicle halted. 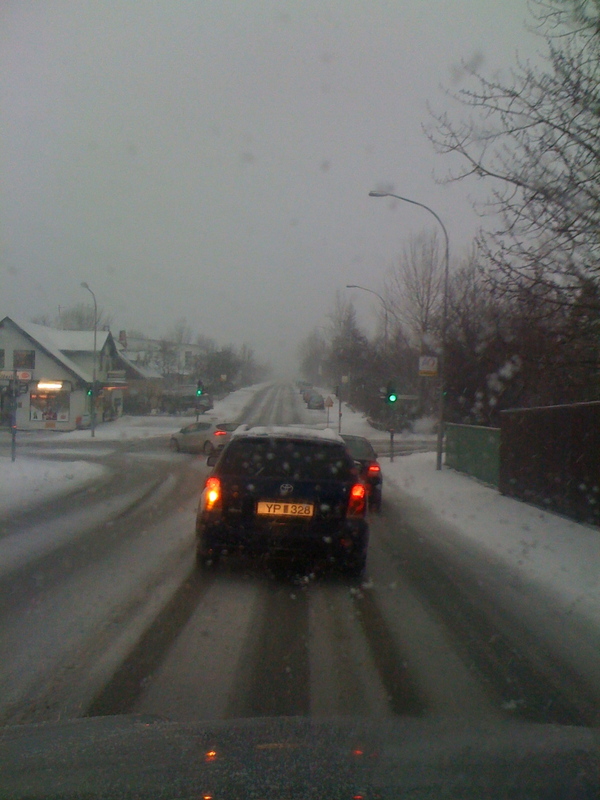 Ahead of me, another car spun in circles, somehow hitting nothing but a patch of snow, then righting itself before heading back along the road. By the time I reached the pool, it was nearly whiteout conditions, but even the overflow parking was full. I flashed my pool pass and looked out to the great expanse of blue. Thick white flakes of snow fell onto the surface, steam rose in wafts. I held my breath; I couldn’t wait to get in. But first there was the ritual of the shower. In Iceland, following pool protocol is mandatory. First, my shoes came off, they have to wait in a rack outside the changing rooms. Inside, I chose a locker and stripped down to nothing. Then, I carried my towel, bathing suit, and shampoo toward the shower. Next to the open shower area, I stored my towel and shampoos, knowing I couldn’t dare touch them again until after my swim. Then, standing beside naked women and children of all shapes and sizes, I had to wash. A sign gives strict instructions as to how and where. And, lest I faltered, a woman stood watch (the so-called shower police) reprimanding anyone who dared to stray from her cleaning duties. Face, armpits, crotch, feet. This time, luckily, no fellow bathers offered commentary or scolding as to my washing methods. Once properly soaped and rinsed, I put on my swimsuit and headed for the pool. My feet moved over the freezing brick path and I had my usual moment of regret: Why would anyone in her right mind want to swim in a snowstorm? But the distance from the showers to the pool is only a few steps and, before I could talk myself out of it, I sunk into the heated water in search of any empty lane. Even in the very warm pool, my body needed to adjust. I thought about the five different hot pots (hot tubs), varying in temperature from hot to scalding, that I’d sit in after my swim. Between the driving snow and thick steam, I couldn’t see but a few feet ahead of me. I dipped my head under the water where visibility was clear, until I found a lane just for me. Then, I began. It was too cold for breaststroke, I had to keep my head mostly underwater, so I pushed off to do the crawl. At once, my body careened through the liquid expanse, floating, swimming, kicking. In one breath, the quiet aqua water, in another steam and the patter of snow on my cheeks. Instead of counting laps, I agreed with myself, as I always do now, on a time limit. 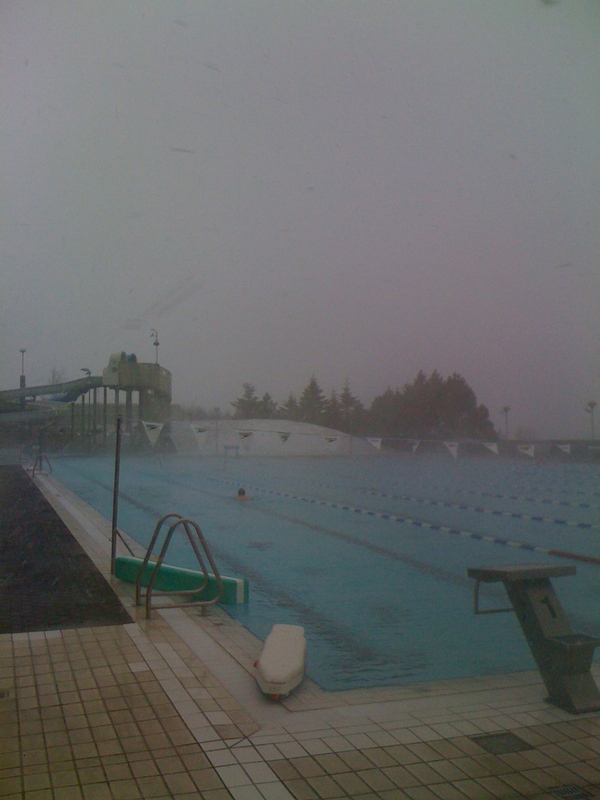 Heading through the mist from one end of the Olympic-sized pool to the other, I swam for fifty minutes. Surrounded by the warm water and not needing to count laps, I thought instead of characters, I told myself stories, I worked over life issues, I mused about my children, I wondered about friendships, I planned elaborate events I’d probably never host and a tea party that I think I will have, using the fine Russian china. On one lap, I reminisced about this same spot, thinking back to my swims during pitch-black mornings when the lights on the pool illuminated a turquoise haze and I swam until the faint pink clouds appeared in the sky. Or the day the wind picked up so fast that waves crashed against my cheeks each time I dared try to take a breath. And so I moved. Back and forth, me, my splashes, and my imagination traveling through the heated water and the quiet snow. This was bliss. After the fifty minutes I, of course, moved from one hot pot to another until I sat in the burning one, watching as thick chunky snowflakes gathered on the head of the attractive young mother, while her three girls jumped around her. When they disappeared, it was just me, the quiet, and the large white puffs falling into hot water. My top three favorite pools in Reykjavik are these. What are yours? 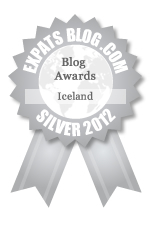 This entry was posted in Exercise, Iceland, snow and tagged Reykjavik, snow, swimming, swimming in Iceland, Winter Solstice. Bookmark the permalink. That sounds amazing. I wish we were there to enjoy the pool and snow. Sounds a lot better then the Polar Bear Plunge that Woody and I did on New Years day. – Ginger D.
I´m not much of a swimmer but I REALLY LOVE going to the pool and sitting in the hot pots when it´s snowing. With my head up towards the heavens…….nothing is more relaxing and meditative for me then the sensation of snow hitting my face while hot water engulfs the rest of me. (pre 2007) the pool pumps in sea water, just enough to let you know it´s different then all the rest. The kid´s area and slide is close enough to the main pool and hot pots that all you need is an occasional glance that direction to know that they are happy and to satisfy your conscious as a watchful parent. 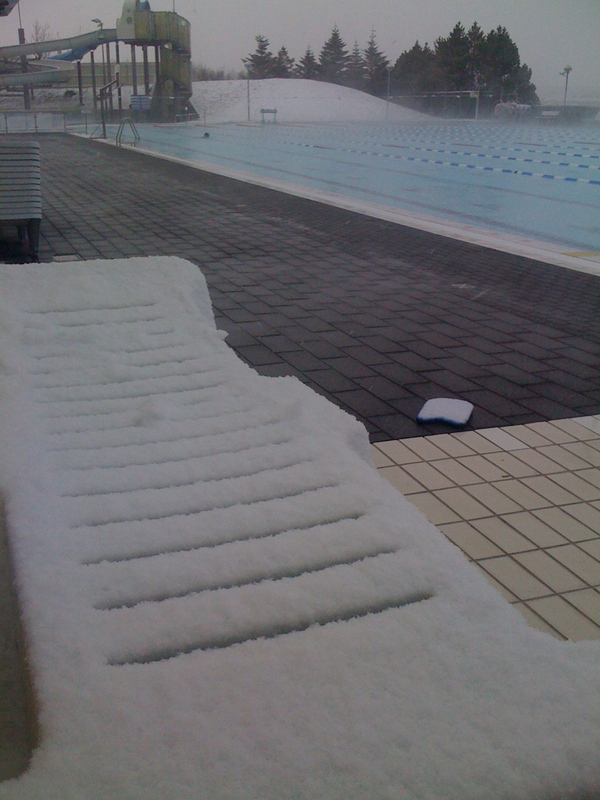 Next time it snows I´ll give you a call for a dip! I really liked Vesturbaerlaug (not sure how to spell it…). Haha I found it funny how some group of old people seem to have the monopoly on one hot tub. I went to different pools a lot and I have never encountered a ‘police pool’ watching your every move. I count myself lucky for that, I think so long as you’re naked and seem to be showering they couldn’t care less what part of your body you’re washing.